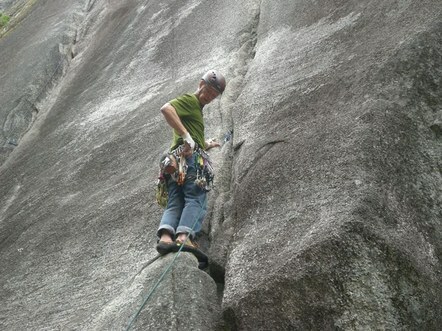 This course teaches you how to lead climb steep rock at crags, using traditional protection. The Crag Climbing course is designed to teach the skills, knowledge, and techniques needed to safely lead traditional routes on outdoor crags. The Crag Course will teach safe use of active and passive protection needed for lead climbing in the crag environment, construction of safe anchor systems for top-rope/lead climbing, swinging leads on mid-5th class (5.4 - 5.8) multi-pitch climbs, belaying a partner from multiple directions, rappelling in a variety of settings, and other pertinent skills. The Crag course does not teach alpine travel and navigation techniques, nor is it a beginning climbing class. Individuals who graduate from the Crag course may be able to apply these skills to other Mountaineers climbing courses; interested individuals should consult with the Administrative branches of the prospective course to determine equivalency. Additionally, obtaining a Remote Medical First Aid Training certification, if not current, is required for graduation. This is an additional course and fee.